My new book is available to buy now from my Big Cartel shop. Pay via PayPal. Also prints and cards from the book. Please click on the link below. High quality, limited edition, Giclée prints, printed exactly the same size as the original painting. Approved by the artist. Signed and numbered. I stood in Helmsley market square this morning, my sketchbook on the car bonnet, gazing skyward. I was watching and sketching Swifts. It is wonderful to see that crescent shape in the sky again after nearly nine months. The Swift watching lead to another, much more unusual observation- three large birds, just white specks against the blue sky were Spoonbills, three of them moving North. I later discovered that three Spoonbills left RSPB St Aiden’s reserve near Leeds, heading North East a little over an hour before- the same three? This sheet of studies was painted in Ampleforth this morning. 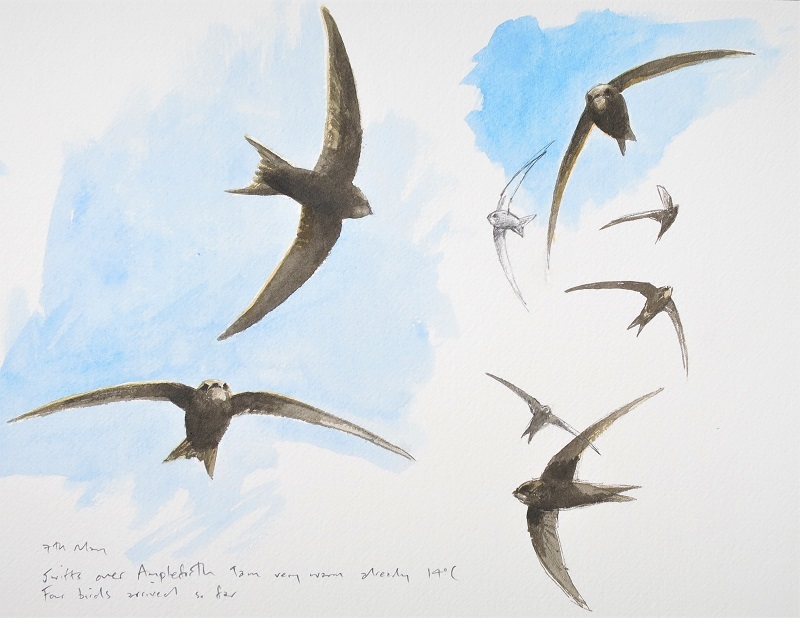 The sky was cloudless and this modest first arrival of Swifts should be joined by many more in the coming days and weeks. In summary I counted 9 over Helmsley, 4 over Ampleforth and none in Gilling East. My winter has been dominated by Hawfinches. The opportunity to know a single species can be so rewarding and I would not swap this winter for one with a stream of rarities. For as long as I can remember Hawfinches have fascinated me, they are right up there with Swift amongst my favourite species. They have a brutish beauty which is a delight to tackle with pencil or brush, subtle colours boldly arranged and a character which is cartoon like with beady eye and massive beak. The strength of that beak is mythical in birding circles; don’t try cracking a cherry or sloe stone with your teeth, easy work for a Hawfinch whose bulky head is full of muscles to operate its stone crusher. When I lived in Wiltshire I watched a pair through a winter and they were elusive and very frustrating at times; hours of observation for a quick glimpse. But this winter has been different. I have been watching flocks of Hawfinches from the Continent. In flocks Hawfinches are more confident, with more watchmen they feel safety in numbers. In recent weeks I have been fortunate to have both a male and a female Hawfinch visit our bird table in Gilling East, North Yorkshire allowing me extremely close views from my studio! Here is a small selection of watercolour studies made this winter. I will be showing more as part of an exhibition at Yorkshire Arboretum in May 2018. Hawfinch. Watercolour £275 unframed, at my studio. We moved to Gilling East from Ampleforth in the summer and I now have a studio ready for visitors. I have room to display original framed work as well as cards and prints, but perhaps the most interesting part of visiting an artists studio is to see the work as yet unframed, fresh off the drawing board. You are also welcome to browse my sketchbooks. Fresh coffee is on offer! Visitors are welcome, but please make an appointment first as I am very often in my favourite studio- the North York Moors and Coast. Please telephone 01439 788014 or email jonathan@pomroy.plus.com to arrange a visit. We are in the middle of the village near to the Fairfax Arms which offers good food and ales!